from May 26 until December 31, The Slav Epic will be exhibited at the Brno Exhibition Center, as part of the Re:Publika festival. The festival celebrates 100 years of our independent state through exhibitions, performances, events, concerts and talks. The nine largest canvases, created by Alfons Mucha between 1910 and 1928, will be located in the main nave of Pavilion H. The Brno exhibition is unique in that, besides the epic, which Alfons Mucha considered to be the peak of his work, his posters, advertisements, calendars and other artifacts belonging to decorative art, in which Mucha was world famous at the end of the 19th century, are exhibited. Some of the approximately 200 Art Nouveau exhibits are new to Richard Fuxa’s collection, so visitors can see them for the first time ever. 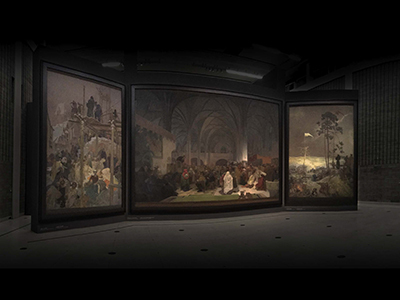 The Brno exhibition will be a truly unique event, combining the two opposing periods of Mucha’s artistic life – the decorative Art Nouveau, which saw him rise to the top of the art scenes within Paris and New York, and The Slav Epic; a confession of the artist’s love of his nation and its history, following no particular trend of the time. Upload attachment (Allowed file types: jpg, png, maximum file size: 40MB. What’s it like to see The Slav Epic in person for the first time?